The NYC Department of City Planning and the NYC Economic Development Corporation hired Michael Singer Studio as a part of a design team lead by Margie Ruddick Landscape to provide planning, streetscape and landscape design for the public spaces in Queens Plaza near the Queensboro Bridge in Long Island City, New York. At the heart of the Queens Plaza design is a stormwater collection, filtration and infiltration system that supports a massive re-growth of vegetation from within the tangled urban core of over 14 lanes of traffic, 2 elevated subway lines, 2 bridges, and a multitude of subways and utilities. The nearly 2 acre project is stretched over 6 blocks and had a total budget of $45M including all associated infrastructure costs – primarily roadways and utilities. Michael Singer Studio ultimately created over 3000 individual sculptural paver, runnel and bench cap elements for the project, which are dispersed throughout the core of the project site. These elements create a sculptural tapestry and unite the project through pattern, texture, form and repetition. 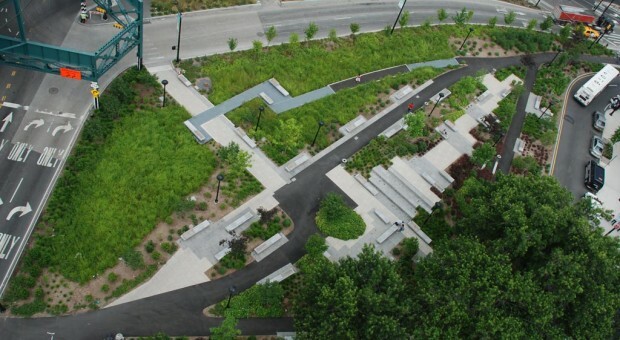 Some elements, such as the runnels and planted permeable paver groups, are an integral part of the stormwater cleansing system for the site. The runnels form the edge of the core wetland and help to direct stormwater flow into the wetland for filtration. The sculptural elements are mostly concrete, the runnels have a copper water diverter embedded within the cast. The elements had to pass rigorous engineering requirements and extensive testing to meet NYC Department of Transportation requirements. The combination of new elements and nearly 500 new trees within this tight urban corridor has created a place of refuge within an active and transportation dominant area of the City. The center of Queens Plaza was officially opened to the public by Mayor Michael Bloomberg and was named Dutch Kills Green after a public naming contest. Dutch Kills refers to the historic name of a creek that used to run near the site. Since completion of the project new hotels, residential development, and a major new commercial tenant – the headquarters of JetBlue Airlines- have made Queens Plaza their home. An online article about this project on Inhabitat can be found here. An online article about this project by the Wall Street Journal can be found here. New York City Press Release can be found here.